There is a lack of understanding of the behavior of unreinforced masonry shear walls. This is attributed to the limited use of this type of construction in recent years especially in North America. In developing countries, however, unreinforced masonry is commonly used. In addition, strengthening and repair of existing masonry buildings requires clear understanding of the behavior of unreinforced shear walls under in-plane lateral loads. There is ongoing comprehensive research program at Drexel University aiming at investigating the use of advanced composite materials for repair and retrofitting of existing unreinforced masonry structures. This paper presents the results of phase II of the program which focuses on the lateral response and modes of failure of unreinforced masonry shear walls under combined vertical and lateral loads. 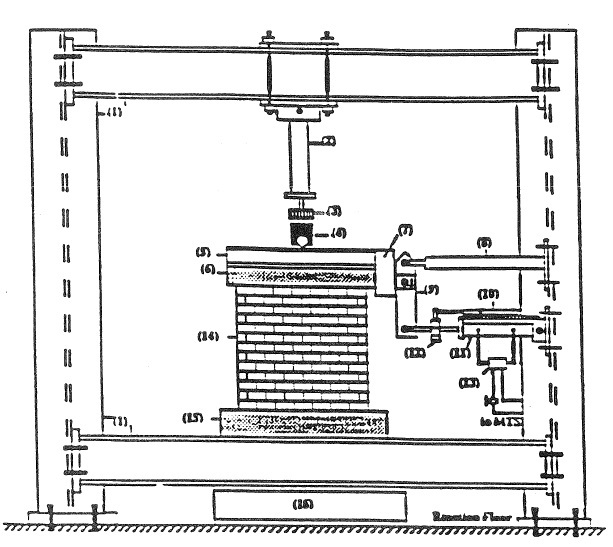 Five 1/3 scale model shear walls were tested under combined vertical load and a specified rate of top displacement by using an MTS systems with displacement, end vertical displacement at the toe and heal of the wall and the diagonal deformation. Three failure modes were identified: rocking mode, joint shear slip and diagonal tension mode. It has been demonstrated that the wall behavior and failure mode is highly sensitive to the level of axial load and wall aspect ratio.